This Item Ships For Free! Industrial Heating Blankets We have industrial heating blankets for just about any purpose. Free Ground Shipping by FedEx is available on all Heating Blankets made by Power Blankets. All Power Blanket model heaters are a safe and heavy duty, for quality heating of any industrial item you may have. Before you buy another brand of the heating blanket, please take a look at Power Blankets. With our limited time, Free Shipping offer this is a deal that can't be beaten. Ground Heating Blankets for Heating Concrete or Surface. 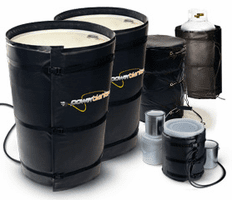 Free Shipping Barrel and Drum Heater Blankets | Heats Drum Contents Quickly | 120-volt | Best Drum Heaters Available | Ships For Free!